The 11th LD Caucus will be at the IAM District 751 Union Hall, 9135 – 15th Pl So, Seattle on April 17, 2016 at 1pm. All delegates & alternates who were elected at the 11th LD Precinct Caucus on March 26th are eligible to participate. Proposed agenda is to elect the delegates & alternates to go forward to the Congressional level and State level. This will be the second step out of 4 steps in electing delegates & alternates to the Democratic Party National Convention in Philadelphia July 25-28, 2016. The Washington State Democratic Party will be holding its caucuses to choose its nominee on March 26th at 10 AM. It will be Washington Democrats’ opportunity to make their voices heard on who should be our next President. Anyone who will be 18 by November 8, 2016 and affirms they are a Democrat on Caucus Day is eligible to participate. Find your caucus site and pre-register: https://www.demcaucus.com/register. The site will give you a registration form that you must print out and bring to your caucus site. If you lose your form, you can always fill out a new one at the site. This is your way of skipping the registration line. We will not have printouts of your pre-registered forms on site. Your caucus site and the address will be on the top of your registration form. Show up to your caucus site before the caucus is scheduled to begin. 9:30am is a good target time. You must show up to the correct caucus site that you were given in step 1. You will not be able to caucus at another site. Caucus! Your precinct will decide which Presidential candidate will get delegates from your group of neighbors. You will also be picking those delegates that will go on to the Legislative District Caucus and the King County Convention. Those delegates will eventually decide who goes to the Congressional District Caucuses, the State Convention, and the Democratic National Convention. Remember: these are all your neighbors and fellow democrats. Be respectful, listen, converse, and have fun! If you can’t show up to the caucus because of religious reasons, military duty, a disability, or a conflicting work schedule, fill out a surrogate affadivit form and send it to the Washington State Democrats. Here is a list of the 11th Legislative District Democrats precinct caucus sites. Remember, you must show up to the correct site! And, pre-register and bring your form to the site. Your caucus site and its address will be on the top of your form. If you missed our last simulation / training event, the Washington State Democrats is having another caucus simulation / training event. Where: Aviation High School Boeing Presentation Center, 9229 E. Marginal Way S., Tukwila, WA. Why: To give constituents an update on the legislative session and listen to their concerns and ideas. The 11th LD Democrats are hosting a couple of caucus simulations for the precinct caucuses next month. Show up to the following event to get an overview of how the Democratic Precinct Caucuses are going to go this year. Interested in showing up? 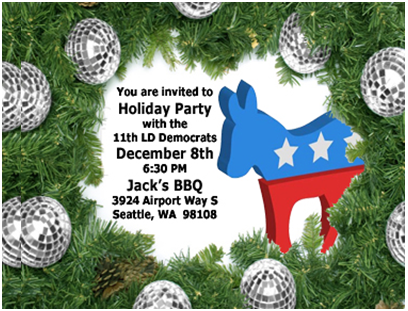 Please RSVP with Rick Polintan (chair@11thlddems.org). plus Happy Hour prices on drinks until 6! * Free parking for dinner (after 4:30pm) weekdays. Parking ticket must be validated to receive the complimentary parking, so be sure to bring your parking ticket upstairs to the event! Renton, Washington, July 17, 2015 – On July 15, 2015, the 11th Legislative District Democrats found a piece of campaign literature from the Monique Taylor-Swan for Renton City Council campaign that showed our organization endorsed her. We did NOT endorse her. The 11th Legislative District Democrats sole-endorsed Ryan McIrvin for Renton City Council Position 4. We asked that Monique Taylor-Swan cease distribution of said campaign materials that states the 11th Legislative District Democrats endorsed her. A network of over 20 leading environmental groups in Washington that influence policy at the state level. The Shell Polar Pioneer that just departed Terminal 5 is a reminder of the decision making power the Port of Seattle Commission has on Seattle’s working port. In 2015, King County residents will vote on Port of Seattle Commissioner Position No. 5. This local election is crucial in determining Washington’s economic future and our impact on climate change. Tickets are FREE but limited. Reserve your spot today. Can’t make it? Share the event to your Facebook friends. Local elections, like this Port Commissioner’s race, have a direct impact on Washington State’s economy and job growth, and our environment and climate action. Don’t miss this exciting opportunity to hear directly from the candidates on a broad range of issues. Join us on June 29th!